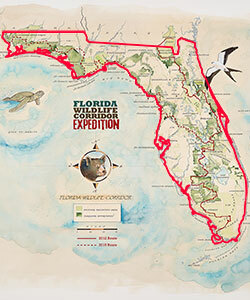 The Florida Wildlife Corridor Expedition, a non-profit organization focused on creating wildlife corridors to keep Florida wild, will launch January 10, 2015. The Florida Wildlife Corridor Expedition team will hike, bike and paddle their way more than 900 miles across the heart of Florida on a 70-day long journey. The Florida Wildlife Corridor is devoted to advancing a statewide network of wildlife corridors in order to ensure the long-term survival of wildlife, the health of life-sustaining freshwater flows and the continued vibrancy of Florida’s rural way of life. Conservationist Mallory Lykes Dimmitt, Biologist Joe Guthrie and Photographer and National Geographic Explorer, Carlton Ward Jr. will make the journey from the Everglades Headwaters in Central Florida, across the Panhandle to the Alabama border. Watercolor by Mike Reagan, designed by Carlton Ward Jr, Tom Hoctor, Richard Hilsenbeck, Mallory Lykes Dimmitt and Joe Guthrie. Click for more information, and to access full map. The trek will show a side of Florida that not many people, including Floridians, get the chance to see. With eleven thousand miles of rivers, 27 springs, and nearly eight thousand lakes larger than 10 acres the Expedition team is taking the road less traveled by traversing the state as native Florida species do. The Florida Wildlife Corridor encompasses a 15.8 million acre opportunity area of minimally developed land. The Corridor team and partners advocate for the protection of the “missing links” of the Corridor, estimated at roughly two million acres of highest priority lands still in need of protection to ensure the long-term viability of the Corridor. The Corridor provides habitat for 42 federally listed endangered species and 176 state listed endangered species. Some endangered species include the Whooping Crane, Florida Panther, West Indian Manatee, Green Turtle, Leatherback Turtle, Hawksbill Turtle, Gulf Sturgeon and many more.